C 72073 Su-15TM Cockpit replacement set for the Trumpeter kit. U 72-92 Su-15TM Correct Vertical Tail for the Trumpeter kit. U 72-93 Su-15TM Correct Nose for the Trumpeter kit. C 72075 Su-15 Flagon A Cockpit replacement set for the Trumpeter kit. U 72-94 Su-15 Flagon A Correct Vertical Tail for the Trumpeter kit. U 72-95 Su-15 Flagon A Correct Nose for the Trumpeter kit. Crisply moulded in very pale yellow resin, Pavla has captured in 1/72 scale all the detail contained in the full size Su-15. In this review I cover six detail and replacement sets for Trumpeter’s Sukhoi Su-15TM and Flagon A. Some of the parts have a small amount of residual resin flash that is easily removed with a sharp hobby knife. Assembly is straightforward with no apparent modification required to the kit plastic before assembly. Modellers with very little modelling skills should be able to install these detail sets. 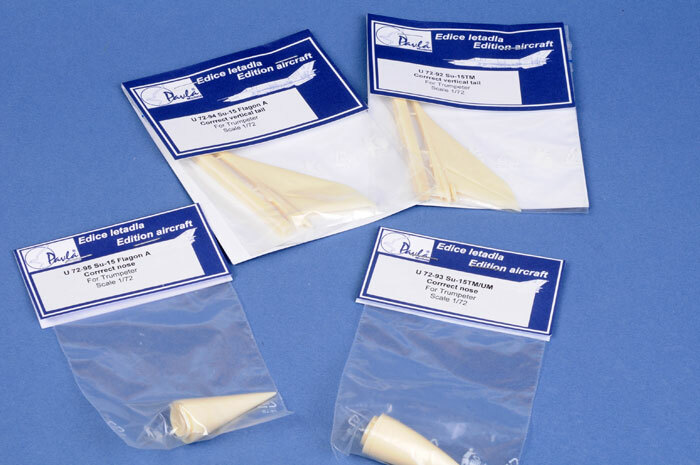 This detail set contains one resin part that comprises of a replacement vertical tail for the Trumpeter kit. The part is a direct replacement that requires no rework. 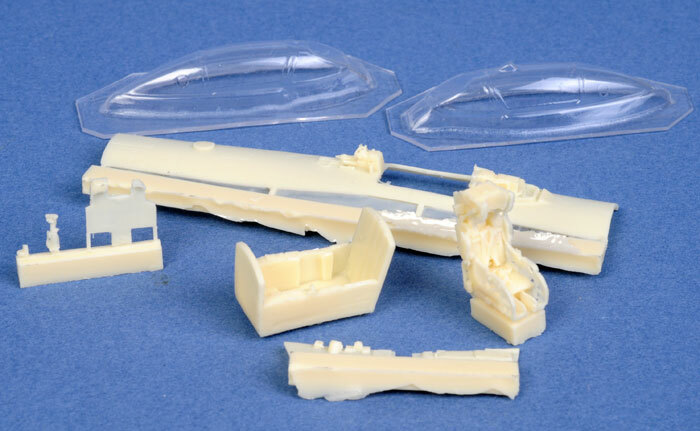 This detail set contains one resin part that comprises of a replacement nose radome with the correct profile for the Trumpeter kit. The part is a direct replacement that requires no rework. This detail set contains eight resin parts that comprises a replacement cockpit tub, sidewalls, ejection seat, instrument panel, control column, gun sight and replacement upper fuselage deck. This set has nice detail in particular the ejection seat detail. The seat is virtually a miniature version of the real thing. Two clear vac formed canopies are also provided. One has a rear facing periscope and one does not. The parts are a direct replacement that requires little rework. These are very nice upgrades to increase the detail of your kits and will look very realistic when fully assembled and painted. Novice modellers should be able to install these parts.